Ten to fifteen years ago, Asia boasted barely five or ten global brands, but at that time, the top Korean brands had an appetite for going global. Most of the leading Korean companies have Chief Marketing Officers in their boardrooms now but only 2-3% of the Fortune 500 companies have one, which means marketing for most companies is still tactical, not strategic. Samsung is the brand that brought Korea to the world. LG is now pursuing this same journey, but in a different way. Hyundai is the other top Korean corporation in terms of branding. Amorepacific is an interesting Korean brand that is now one of the fastest expanding cosmetics and skincare brands in China by representing ten different organically grown brands, and they have set their direction on more global markets. Korean brands are very good in innovating. Though they have not necessarily been first-movers, they have moved fast and are starting to gain confidence. Korean brands are a hit because Korea is so technology driven and Korean companies are innovative and spend a lot on R&D. They are quality focused, such that Korean brands are, in many ways, ahead of the rest of the Asia-Pacific region in this aspect. Design is another area that Asian brands are starting to take notice of. Martin Roll noted a concern: Korean firms tend to employ mostly Koreans. Even though a lot of very good Korean talent has lived overseas and come back to work in Korea, Korean companies still aren’t achieving a global culture like you can find in Nike, L’Oreal, LVMH, BMW, Apple and Procter & Gamble. To become a global company, Korean companies need to mirror the global consumer in their corporate makeup but Korean companies are behind the curve in this trend. Martin Roll mentioned Singapore Airlines as an example of a leading Asian brand that has been true to their roots and origin by actually delivering the great service they promise. They spend 15-20 working days every year on training everyone within the company. They also invest a lot in new aircraft and technology so that they contribute as much as 20% to the national brand of Singapore. 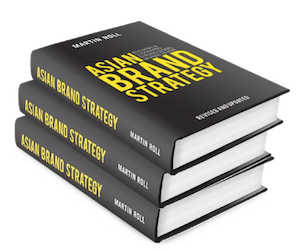 It took Western brands 50-100 years to do what Asian brands have done in 10-20 years, and Korean businesses and brands have all the chances for being ahead of the curve – as long as they do not lower their ambitions and continue to aspire for winning globally.